What is the constraints in the list of inputs? Abstract resources (or types of recourses) are nonfinancial recourses that are not associated to real appointments yet. I.e. “business analyst” is an abstract resource, but business analyst John Black is personalized “resource”. For the same reason abstract resources have no schedule of availability because it is supposed that the project will be provided with these resources as needed. 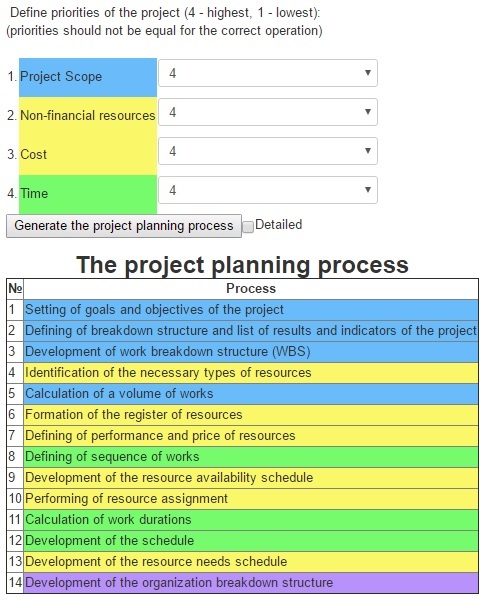 Standard performance and cost are defined for abstract resources to be used for project planning. 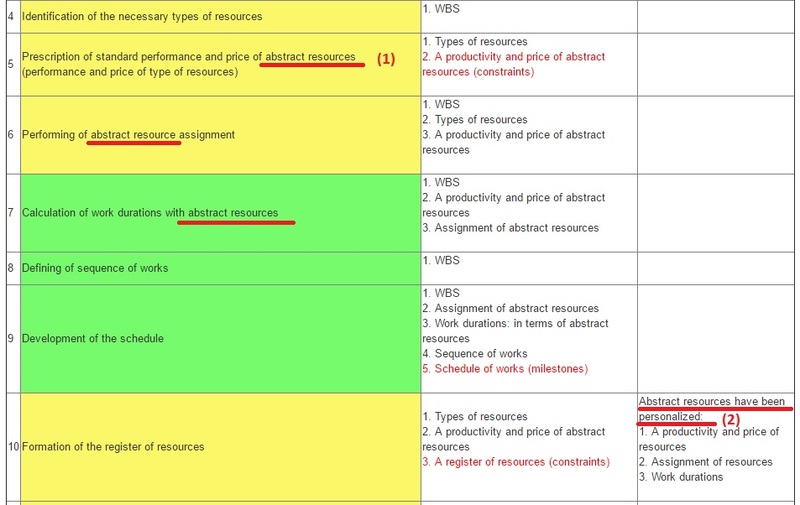 Later abstract resources will be personalized when the register of resources is forming i.e. they get its names (see 2 in the figure). Standard performance and cost should be met when selecting candidates. Note: if there is defined resource pool in company these resources are not abstract and each resource has its availability schedule. What happens if two or more parameters would have equal priorities? Do planning processes by PM2BP match the PMBoK? PMBoK proposes unified planning process regardless of project priorities. On the contrary, PM2BP forms different planning processes taking into account your priorities. The planning of risks, quality and other project aspects will to be realized in further versions of PM2BP. Another inputs of subprocesses are not displayed (but implied) in current version (for example: archive data or expert judgments). Where is project charter development in PM2BP processes? 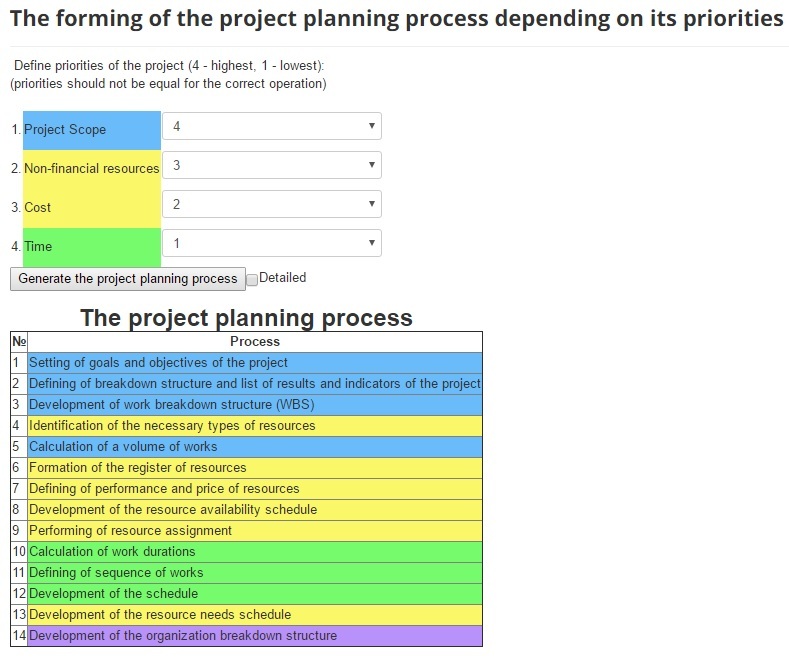 Main chapters of project charter are developed as part of “Setting of goals and objectives of the project” and “Defining of breakdown structure and list of results and indicators of the project”. Where is planning of risks, quality and another aspects? These functions are to be realized in further versions. How to receive information about new PM2BP features? The subscription will be launched soon. Еmail us and we will include you in the first newsletter.